Venus, Mars, Neptune, the South Node, and asteroids Chiron and Pallas all meeting up in transcendent Pisces make for a very complicated mash-up. People will go to the mat for their romantic, artistic, and spiritual passions, even if they happen to be misguided in their pursuits. Temper fantasy with reality. Here is your Weekend Horoscope! There’s so much more to know! Click here for your extended reading. Secrets and other clandestine activities that demand to be kept behind closed doors are consuming way too much of your time and attention. You can’t bring things out into the open just yet, so for now you will have to find a way to deal. Be practical in your search for solutions. Friendship feels super weird right now. Some of your pals might be losing themselves to drugs, alcohol, or strange spiritual pursuits, while others are just acting strangely. If you can’t deal, you don’t have to. Hang out with your significant other. If all else fails, you are pretty good at entertaining yourself. Staying out of the public eye is probably a good idea. No matter how much you try to act normal, you just can’t hide certain idiosyncrasies. You can be as weird as you want with friends and close family, but your boss, colleagues, and other influential types aren’t ready for the real you. 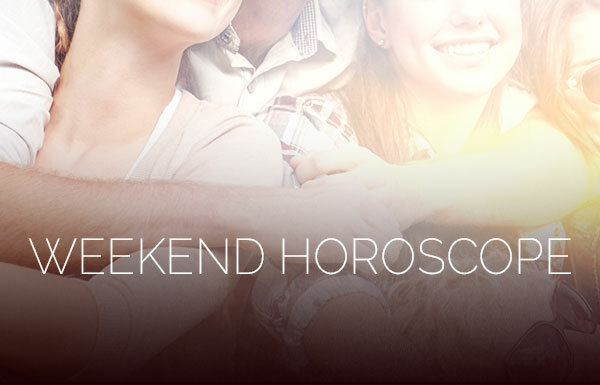 Your Weekend Horoscope shows that you feel passionate about your beliefs. However, this doesn’t necessarily suggest that you are on the right track. Be willing to question any dogma that justifies your own worst tendencies and keeps you stuck in a rut. Perhaps you can’t see the forest for the trees? Making demands of others could yield unusual results. The best way to avoid a weird situation is by keeping your expectations to a bare minimum. You could find yourself obligated to someone in a way that you are not really comfortable with. It might be better to handle matters on your own. Certain people expect that you will continue to play the same role for them regardless of the fact that you have outgrown that dynamic. It can be tempting to repeat the past and to fall back into that same old pattern. Don’t go there, Virgo. It’s time for you to grow. With so much activity in your work life, you might be feeling stressed. Before you jump in and tackle tasks both at home and at your workplace, cultivate a vision of your desired outcome and then map out a plan. Getting a different result requires doing things in a new way. You feel pretty inspired about both romance and your creative pursuits, yet you could still find yourself struggling to get out of a rut. The problem is that you are too focused on these matters. Spending time with a friend or participating in a group activity can provide a fresh perspective. Your Weekend Horoscope indicates that home and family matters are all-consuming, yet you don’t seem to be too motivated to change the dynamics of what’s going on. Giving more time and attention to your professional life can help to create balance and will ultimately provide greater fulfillment. Overthinking a situation leads to paralysis by analysis. Contemplate the bigger picture instead of giving so much of your attention to the details. If you can’t make a decision based upon the information at hand, then it is a sure sign that you need to give it a rest. It is great that you are fired up about making money, but are you on to something new or rehashing an old idea? Right now it’s hard to be objective. Connect with a financially savvy person who can point out your blind spots and get you on the right track. Your Weekend Horoscope shows that you feel pretty empowered, but are you using this energy to grow or to reinforce old habits and patterns? The best way to evolve right now is by focusing on others. You have something to offer friends and loved ones and they can bless you in return. How Do You Know When to Change?